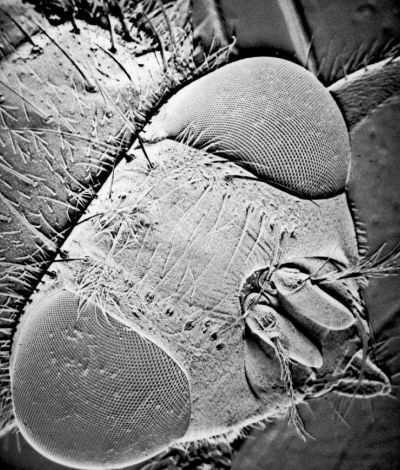 Meet a scientist whose work involves high-precision photographic enlargements of a microscopic world we seldom see … Mark Armitage talks with Tas Walker about ‘the things that are not’. ‘I distinctly remember when I was infected with the microscope bug’, recalls research scientist Mark Armitage. ‘I was 16 and had spent my summer vacation at a marine science station, examining tiny planktonic algae.’ After that, microscopes and the microscopic world became his life passion. Over the years, he has worked for world-famous microscope manufacturers: Zeiss of Germany, Olympus of Japan, and Reichert of Austria. For the last 18 years, he has run his own microscope/consulting company, Micro Specialist, in Los Angeles. Mark likes to call the tiny objects in his microscopic world ‘the things that are not’, borrowing a phrase from 1 Corinthians 1:28. They remind him of an overriding theme of Scripture—that the Creator God delights in using small things to conquer the strong and powerful. Mark has aimed his magnifying lenses at many things. The list is almost endless, and includes the fields of botany, microbiology, medicine, materials science, forensics and geology. Mark is never disappointed by what he sees with his microscopes. Compound eyes of a fly are made of thousands of individual optical units (ommatidia) precisely arranged—exquisite miniature design. 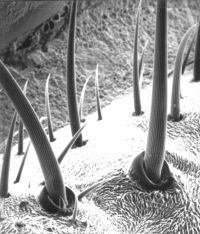 Even the hairs on a fly showprecision engineering. Gruesome sucker and mouth of parasitic worm, now harmful to humans because of the Fall. 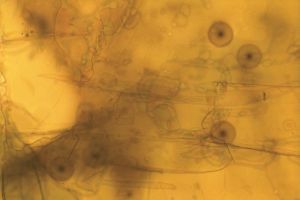 Fungal cell of a lichen is as complex as a huge modern city, but miniaturized. He remembers the time he stood in an operating room and used a surgical microscope to study a live human brain. On another occasion, at the Kennedy Space Center, he examined the vibrant image of astronaut blood. He also recalls working in a hyper-clean environment at IBM and looking at semiconductor wafers. 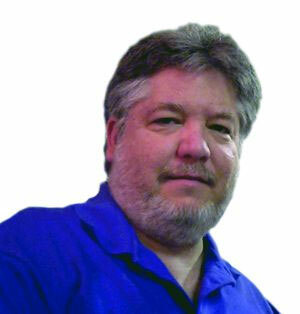 Mark has always loved science and showed a strong aptitude for it. But he has not always been a Christian or a creationist. He was born in Chicago, and for his first 15 years lived in Latin America. His family was Catholic, and he spent all of his primary and secondary school years in strict Catholic schools. ‘I really tried to be a good Catholic,’ Mark explained, ‘but my life was wracked with sin. I did pretty much anything I wanted to during the week, as long as I was in the confessional on Saturday and Mass on Sunday.’ When he enrolled at the University of Florida, his life became even worse. He stopped going to Mass and became a heavy drug user. Fortunately, things changed when some of his friends trusted Jesus Christ as God and Saviour, including a friend who invited him to church. Mark recalls, ‘The Gospel message preached that day hit me like a baseball bat! I was in a fog for a week. One of the college leaders came to my apartment and showed from the Bible how I could never earn my way to Heaven by good deeds, penance or ritual. A week later, I surrendered my life to Jesus Christ and was baptized.’ His transformation was so great that his family was amazed! Although Mark had become a Christian, he heartily adopted the theory of evolution because he thought ‘no scientist questioned evolution’. But his classes at Florida bothered him. The professors ridi­culed the Bible, and he saw how they demeaned creationists. Mark wanted a career in science, so to satisfy his inner doubts he secretly tried to mix what the Bible said about creation in six days with deep geologic time. He assumed that God probably used evolution in some way, but it never really made sense to him. So for years he simply ignored it. When he moved to California in 1984, an engineer at his church asked him to help with showing the Origins film series, which explained how science fitted with the Bible. That was a life-changing experience, Mark explained. ‘The scientific content in those films absolutely floored me!’ He became so hungry for information on the scientific basis for creation that he bought almost every book available. The film The Genesis Solution was particularly life-changing, as was the book The Lie. Mark says the changes in his outlook and new zest for life demonstrate that what you believe about where you came from affects your whole world-view. After this, he made a point of visiting Christian schools and colleges to demonstrate his microscopes. Understandably, he was excited to share what he had learned about the scientific evidence for creation. He came to know the biology and science department heads at these schools, but, to his surprise, he discovered that they most strongly believed in evolution over millions of years. Mark explained: ‘Evolution is a structure supported by two main pillars—chance and deep time. Diatoms (Bacillariophyta) are microscopic single-celled organisms that produce beautiful opalized shells called frustules. Their intricate and ornamented designs display near endless variety: e.g. circular, six-sided, square and triangular. These radiohalos in mica are spheres of colouration caused by decay of radioactive material at their centres. Human red blood cells, or erythrocytes, are about 7 µm (micrometres, 1 µm = 1/1000 of a mm) across and look like a cake depressed in the middle. Also, Mark has seen the pillar of deep time toppling beneath his microscope. He has found radiohalos (minute spheres of discolouration) of short-lived radioisotopes in biotite in granite. These show that granite rocks (a major component of the earth’s crust) formed suddenly, maybe within days or minutes. Some recent exciting microscopic work has focused on zircon minerals (ZrSiO4)—tiny crystals in biotite from granite.10 Scientists discovered these crystals contain a large proportion of helium, which is a by-product of the radioactive decay of uranium. Why would helium in zircons be significant to the age issue? Batten, D. (Ed. 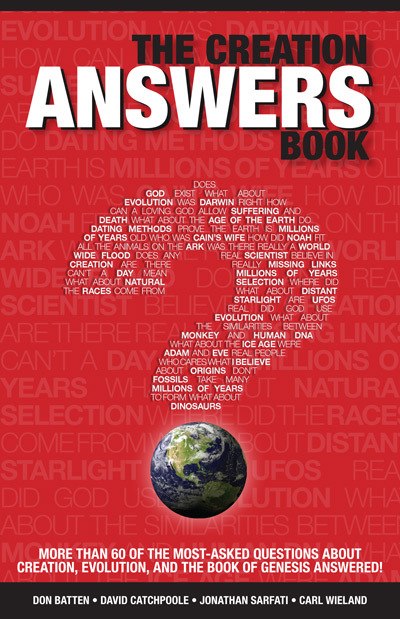 ), How did bad things come about, The Answers Book, Creation Ministries International, pp. 91–100, 1999. Also Death and Suffering Questions and Answers. Return to text. 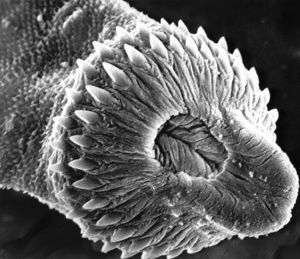 Armitage, M., Man, micro-parasites and electron microscopy of trematodes, J. Creation 11(1):93–105, 1997. Return to text. Armitage, M., The scarab beetle under SEM—fluted vase or sensory appendage? CRSQ 36(3):135, 1999. Return to text. Howe, G. and Armitage, M., Lichens: a study in color, CRSQ 39(4):245–251, 2003. Return to text. Armitage, M., The goblet cell, CRSQ 37(4):248–249, 2001. Return to text. 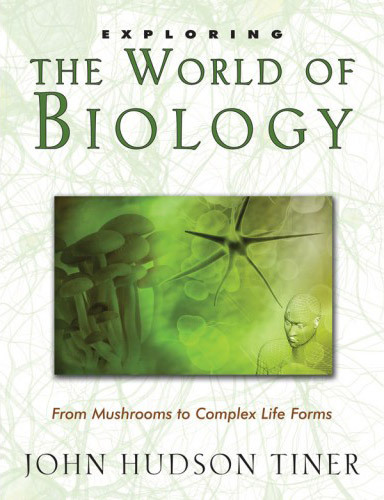 Armitage, M., God’s micro world, Creation 14(4):10–13, 1992. Return to text. Armitage, M., Internal radiohalos in a diamond, J. Creation 9(1):93–101, 1995. Return to text. Armitage, M. and Back, E., The thermal erasure of radiohalos in biotite, J. 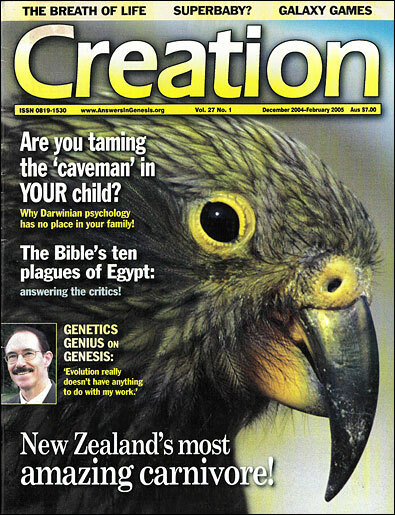 Creation 8(2):212–222, 1994. Return to text. Wieland, C., Radiometric dating breakthroughs: New evidence for a young earth, Creation 26(2):42–44, 2004. Armitage, M., New record of polonium radiohalos, Stone Mountain granite, Georgia (USA), J. Creation 15(1):86–88, 2001, and Walker, T., New radiohalo find challenges primordial granite claim, J. Creation 15(1):14–16, 2001. Return to text. Armitage, M., Helium retention in deep core zircons, American Laboratory 36(14):17–21, 2004. Return to text. Humphreys, R. et al., Helium diffusion rates support accelerated nuclear decay, 5th International Conference on Creationism, Creation Science Fellowship, Pittsburgh, Pennsylvania, USA, pp. 175–196, 2003. Return to text.